This is an event review by John Baxter, a catalyst for better futures. You can follow him on Twitter via @johnsbaxter or check out his blog here. 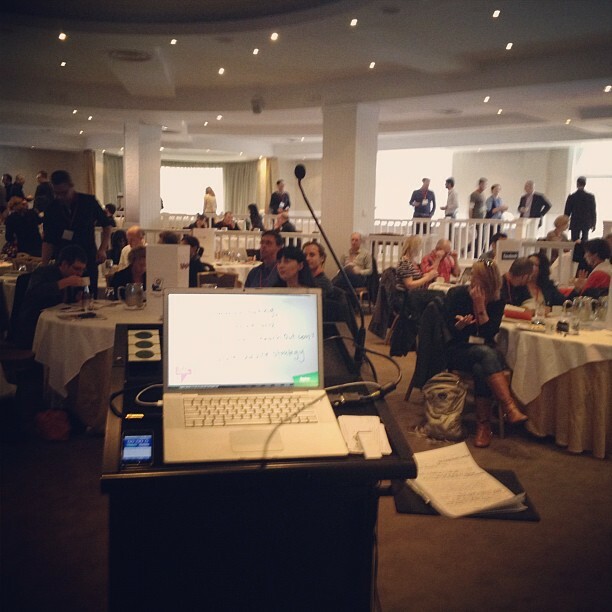 I still carry fond memories of the Service Design 2012 conference, in Melbourne in early May. The welcome packs were like the obligatory Christmas present from a relative that you expect to disappoint, but actually hits the mark. Post-its! A Sharpie! We get to play! As the day progressed it was clear it was actually a fairly serious conference. In fact, it was a little too serious to play – those that need their design in interpretive dance might not have survived. The day did have slow moments, and an overload of information – but serious need not be dull or dry. The organisers are fastidious curators, and nobody seemed to sleep through any presentations. I think designers are taught at school that they can’t present an epic poem in a slide deck. As a non-designer, I got a lot out of the sessions on the value of design. I have filled my conference booklet with notes, and my head with a wildfire of ideas. Three cheers especially to Damian @protopartners, Justin and Mel @dma_canberra and Iain @iain_barker who will keep the engine running for months. I know the practitioners in the room got stuck into the case studies and presenters’ experience with gritty service design challenges. I also met most of the rock-your-socks cool Aussie service designers out there. And the entire population of New Zealand. The value of service design was a recurring theme throughout the day – but it also felt a bit like the elephant in the room. Presentations proved it’s easy to preach the value of design to the converted, but ultimately none were that convincing. Nobody showed they understand the role of service design with enough sophistication to demonstrate its value from an external perspective. That is not to say that nobody can, but it was somewhat disappointing that nobody did. Overall, UX Australia puts on a really good conference. Talking to Steve @docbaty and Donna @maadonna you realise why – more thought goes into it than your average degree, and while arguably fanatical it does pay off. UX Australia will be fostering a professional service design / UX community for a little while to come, though the format for the next design event is still to be determined. A four day UX conference is happening in Brisbane in August, see UXAustralia.com.au. It includes a couple of days of workshops and should be pretty rad if that’s your cup of tea.